How to convert XML to a different data format? Let's consider a common situation in today’s software development world: a web service or another process provides an XML document with hundreds of elements and attributes. You as a developer are facing a task of creating an Excel spreadsheet or MS Access mdb database from that XML. So you have an XML document that you need to convert into a more readable and editable file format. There are several solutions around Internet that could help you somehow to solve the task. However let’s try to make your task a little bit complex. 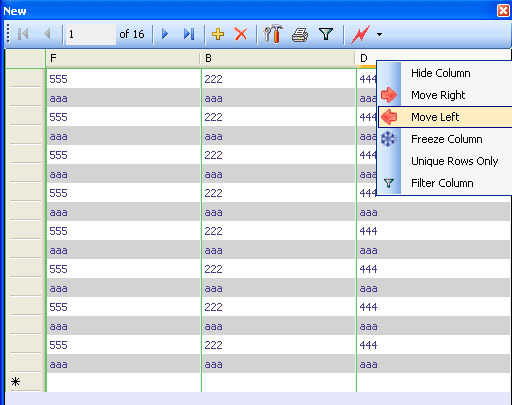 You are looking to create an Excel file by selecting only some of the Columns from an XML. 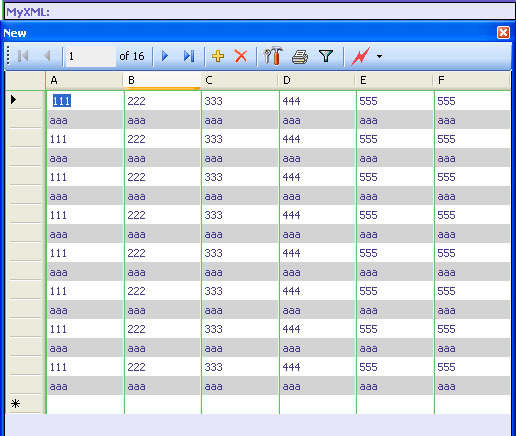 The columns are not is the correct sequence for the Excel so they need to be mapped. You have an XML that contains columns A, B, C, D, E, F, etc. You only need data from columns B, D, and F.
But in the output Excel file the sequence has to be F, B, and D.
To accomplish the task we will use XMLFox Advance that is a useful XML and XSD schema editor. By using XMLFox Advance you can output data to several other data format files. 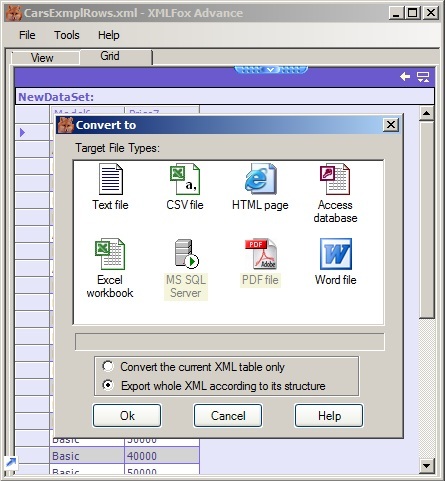 The Editor allows you export XML tables or whole XML to the following data files: TXT; convert into CSV (Comma Separated Value) file, convert into HTML page, create MS Access database, upload XML into SQL Server database, convert to PDF, and create Excel file. The "Better Grid View" interface usage makes the XML converting much adaptable. You are able to remove fields and/or shuffle the order of fields to set up XML conversion. 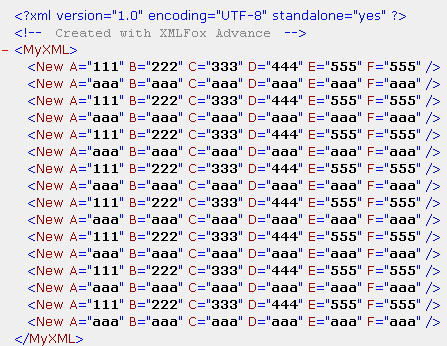 So we have to hide all columns in MyXML.xml except B, D, and F. Then we need to shuffle the columns’ sequences to F, B, and D.
By clicking Export to button XML conversion interface will pop-up. 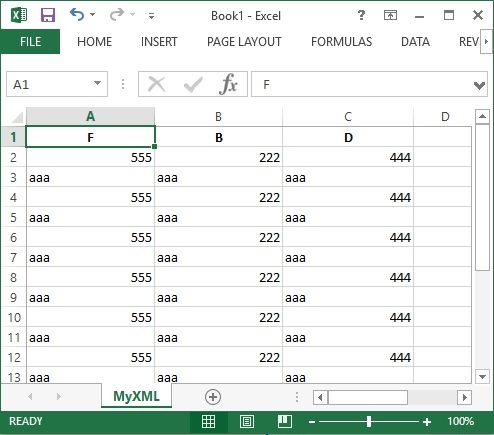 XMLFox Advance translates XML data to Excel spreadsheet format where it can be edited, printed, and saved as required in MS Excel interface. Because XMLFox Advance was designed to be a smart one click solution it does not require XML, DTD, XSD Schema expertise or other XML specific knowledge. In XMLFox Advance you can output data to several other data format files. The Editor allows you export XML tables or whole XML to the following data files: TXT; convert into CSV (Comma Separated Value) file, convert into HTML page, create MS Access database, upload XML into MS SQL Server database, convert XML to PDF, and create Excel file. It is pretty easy and fast enough. The exclusion of fields and the reordering of fields make your XML file transformation much flexible. Also other "XML to" transformations such as filtering can be performed through "Better Grid View" interface that allows for intricate mapping and transformation without the need for user written code.